Diane Astrup Scalese, through her talent as an engraver, has elevated the traditional trappings necessary in any cowgirl or cowboy’s life into functional works of art. Working in steel, silver, gold, brass, and platinum, her spurs, bridle bits, buckles, conchas, and firearms shine under her Western bright cut engraving. Raised on her family’s grain and sugar beet farm outside of Moorhead, Minnesota, Diane and her siblings grew up enjoying horseback riding and understood the importance of good equipment. She attended Montana State University (MSU) as an art major but ultimately graduated with a Bachelor Degree in Animal Science/Livestock Nutrition. She met Bob Scalese there, a range conservationist, who always wanted to make custom bits and spurs. They made their home in Dillon, Montana with their two sons, Tom and Buck, and started Sweetwater Silversmith a few years later in 1986. The metal work came naturally to Bob, but he found engraving frustrating. Curious to learn what was involved, Diane watched him make a few cuts. Instantly, she knew she had to try. As there were no engravers around willing to show her, she had to teach herself by studying old belt buckles and bridle bits and experimenting with gravers and sharpening. Much of the old gear was poorly engraved, and she wanted to make the engraving the focus of the piece, not just a way to brighten. With Diane’s spectacular engraving on Bob’s spurs, their collaborative works of art have been chosen as the Official Spurs of the Montana Centennial of 1989, the Official Spurs of the 1989 Montana Cattle Drive, and the 1996 Official Spurs of the Northwest Stockgrowers Association’s Centennial Cattle Drive of Alberta, Canada. Though most of their work is commissioned, they have been selected for juried exhibitions and have shown their work in art shows and museum exhibitions all over the USA and Canada. After 6 years of bright cut engraving, Scalese became intrigued with firearms engraving. She learned of a class in Trinidad, Colorado, taught by Master Firearms Engraver John Barraclough. John opened a whole new world of steel engraving, precious metal inlays, and was a true teacher, enthusiastic to share his knowledge and pass on his techniques. 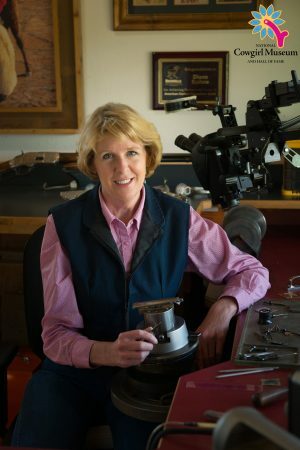 Diane joined the Firearms Engravers Guild of America in 2000 and attained Master Engraver status in 2001. That same year, Scalese was asked by GRS, a Kansas company that makes engraving tools, if she would be interested in teaching classes in Western bright cut engraving. Since joining the GRS instructors, she has taught hundreds of students and has done demonstrations throughout the United States, Canada, and Western Europe. Meeting with engravers from all over the world, she appreciates the opportunity to exchange ideas and share techniques. Highly recognized for her work, Scalese was the Academy of Western Artists Engraver of the Year in 2003. She and her husband have contributed to books and articles, and she created a DVD set demonstrating her techniques. Having been told many times that “women can’t engrave,” Diane Scalese has worked hard to introduce more women to the world of engraving, as well as Western silversmithing. She knows that through teaching, she can reach more women who are interested in this craft that is largely male-dominated, offering an open door policy for anyone interested in the art of engraving.